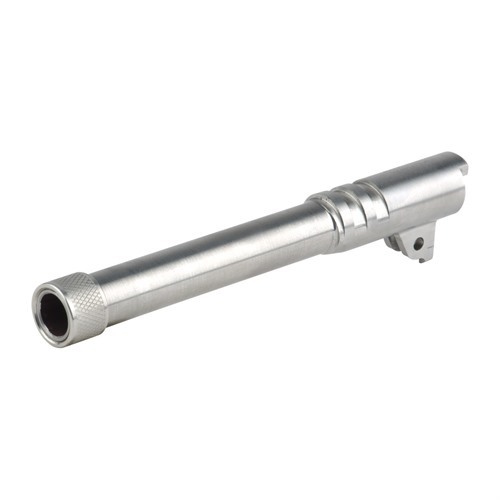 Match Grade 1911 416 Stainless Steel Threaded Barrels. Chambered in 9mm and 45 ACP. 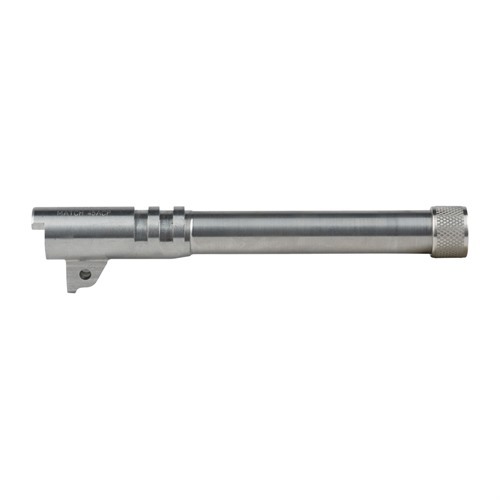 9mm barrel features Wilson/Nowlin style ramp. 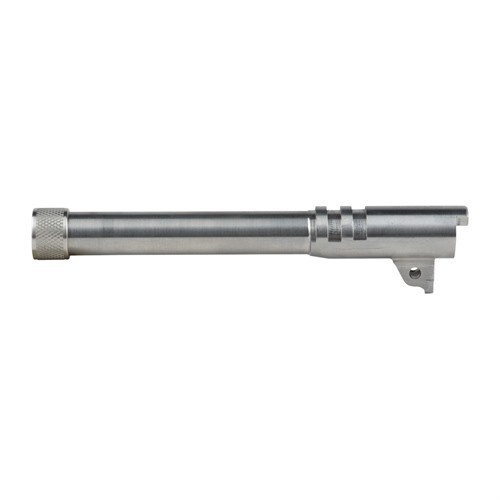 .45 ACP barrel thread pitch is .578x28. 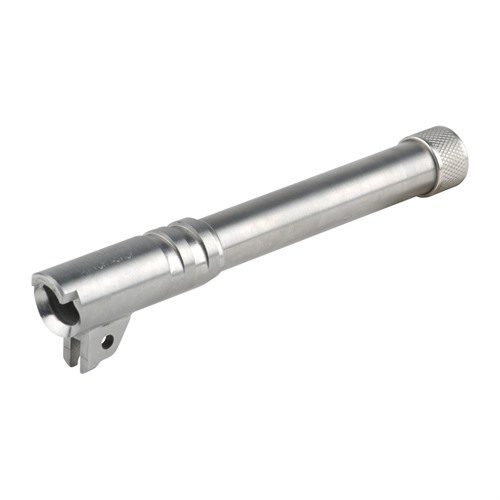 9mm barrel thread pitch is 1/2x28. Barrels are 5.755" OAL. Gunsmith fit is required. Match Grade 1911 416 rustfritt stål Gjengede fat. Kamret i 9mm og 45 ACP. 9mm fat funksjoner Wilson/Nowlin stil rampen. .45 ACP fat tråden pitch er. 578 x 28. 9mm fat tråden banen er 1/2 x 28. Fat er 5.755" OAL. Børsemaker plass kreves. When I opened the package of the new barrel that it came in, I assumed it was a Storm Lake brand barrel. The threaded thread protector is an exact match of theirs, but the laser engraving is different on the barrel hood, the length of the barrel is also perhaps 1/4 inch shorter so I'm not positive it's their barrel. Could be. The fit of a "gunsmith fit" barrel requires a lot of work. On my example barrel that was installed in a Colt 5" government pistol, the chamber needed to be cut an additional .010 thousands for the go gauge to drop in. The upper lug gave me .025 thousands lock up, so I needed to file the upper lugs deeper to get .045 minimum recommended lockup. The hood length was .015 too long and needed to be trimmed. The right side of the barrel hood was about .045 too wide and needed trimming. The left side of the hood needed .001-.002 to finish up. The bottom lugs needed trimming, not only where the stop pin rides but in front so the slide stop pin would clear. The threads were cut nicely so when the AAC silencer threads on, there is no wobble of the silencer. The length of the 5" barrel was perfect just sticking out enough to fully tighten the AAC silencer using a standard barrel bushing. I have not test fired the new pistol barrel, but I'm confident it will shoot well. Overall, I'm quite pleased with the barrel, and everything went well with the machining and fitting of the barrel to the pistol. Remember this barrel required a barrel bushing, pin and link as they were not provided. The link of course is unknown prior to fitting the pistol so I'd recommend a Wilson Combat link set of 5 to cover the exact size needed. Produsentnr. : SP0037 Match Grade 1911 416 rustfritt stål Gjengede fat. Kamret i 9mm og 45 ACP. 9mm fat funksjoner Wilson/Nowlin stil rampen. .45 ACP fat tråden pitch er. 578 x 28. 9mm fat tråden banen er 1/2 x 28. Fat er 5.755" OAL. Børsemaker plass kreves. Produsentnr. : SP0039 Match Grade 1911 416 rustfritt stål Gjengede fat. Kamret i 9mm og 45 ACP. 9mm fat funksjoner Wilson/Nowlin stil rampen. .45 ACP fat tråden pitch er. 578 x 28. 9mm fat tråden banen er 1/2 x 28. Fat er 5.755" OAL. Børsemaker plass kreves.